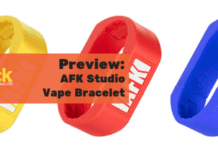 Home New Product Geekvape Flint MTL Kit Preview – Nice Little Nic Salt Kit! Geekvape Flint MTL Kit Preview – Nice Little Nic Salt Kit! The Geekvape Flint MTL kit includes the Flint Vape Pen style mod and the Flint tank. The Flint tank is designed for MTL vapers. Mouth To Lung vapers are usually ex-smokers and use tanks which have quite a restricted airflow. MTL tanks are lower powered as you get a good throat and nicotine hit using high Nicotine E-liquid or Nic Salts liquid. The Flint tank has 5 different sized airflow inlets and you can adjust the airflow to your preference by rotating the ring at the base of the tank. A sliding top cap allows you to fill the 2ml capacity tank through the top. The NS coil is designed for Nicotine Salts or high nic e-liquid and has a 1.6ohm resistance. I am not sure if any other coils are compatible with this tank. The battery part (or mod) has 3 power settings – 7W (low), 8W (medium) and 9W (high). Altering these power settings will increase the flavour/heat output of the vapour. The LED displays which power setting you have chosen. Inside the mod is a 950mAh internal battery and again the LED shows the battery capacity remaining. Apparently this kit is water resistant. It has an IPX5 rating so a leaky tank or a bit of rain should not damage the internals of the mod. There are 4 colours to choose from – Black, Gunmetal, Serenity Blue and Rainbow. 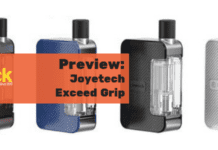 This looks to be a nice little kit – ideal for starters or those wanting to quit the ciggies. Will you be grabbing a Geekvape Flint MTL Kit to kick start your or someone else’s vaping journey? Let me know in the comments below!